For the curious, no this blog is not dead. The offseason is upon us, so it is time to look forward to 2015. Sixteen FBS schools will have new head coaches when the 2015 season begins. This semi-regular piece will analyze the teams and the coaches they have hired in order to offer a prediction regarding the schools’ prospects for 2015 and beyond. We’ll begin in western Pennsylvania. In many ways, the Panthers bowl game on the second day of 2015 was a microcosm not just of the 2014 season, but of their recent past as well. Since upsetting West Virginia in their final game of 2007, the Panthers have played in seven consecutive bowls, the second longest streak in school history. However, despite some impressive wins in that stretch, the Panthers have never been able to break through. They opened 2008 with a loss to Bowling Green of the MAC and closed it by losing a snoozer to Oregon State. They nearly won the Big East in 2009, but a missed extra point cost them a chance at overtime against Cincinnati. They lost to West Virginia with a chance at the Big East title in 2010. They gave Dave Wannstedt and his mustache the boot following the 2010 campaign and hired an up and coming mid-major coach in Mike Haywood. Things didn't exactly work out. They then tabbed Todd Graham (a realtor’s best friend) to be their head coach and while he lasted longer than Haywood, his longevity at the school was not quite the Bowden/Paterno persuasion. Next, they chose Paul Chryst to be their savior, and while he lasted three seasons, the Panthers never finished better than 7-6. The Chryst era opened rather inauspiciously with a loss to IAA Youngstown State and ended with a road upset against Miami that enabled the Panthers to qualify for a bowl. Before the bowl collapse, Chryst bolted for Wisconsin (after Gary Andersen left for Oregon State and Mike Riley left for Nebraska). Now the Panthers have selected Michigan State defensive coordinator Pat Narduzzi to lead them. Pat Narduzzi has been a defensive coordinator for Mark Dantonio since 2004. I have calculated Yards Per Play and APR numbers back to 2005, so nearly his entire record as a defensive coordinator is included in these numbers. The following table lists the Yards Per Play Allowed (YPPA) and Defensive Touchdowns Allowed (DTD) by Narduzzi’s defenses in conference play since 2005. Since Narduzzi coordinated these defenses during this time period, this seems like a suitable method to rate his coordinating prowess. Personally, I think YPPA is superior to DTD because occasionally offense and special teams can put a defense in a precarious position, if drives start in their own territory thanks to turnovers or bad coverage units. I assume dear readers that you are able to think for yourself, so I have included them both. 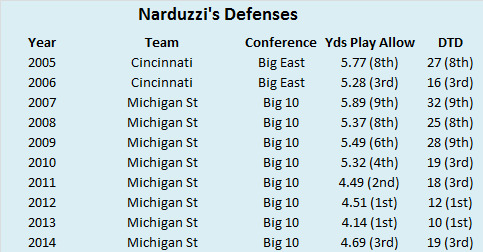 As you can see, even a highly regarded defensive whiz like Narduzzi has a few blemishes on his record. The 2005 season at Cincinnati (his and Dantonio’s second in the Queen City) and his first two seasons at Michigan State produced bad defenses. Out of the ten year sample, I think we can safely say Narduzzi coordinated bad defenses three times (2005, 2007, and 2008), mediocre defenses once (2009), good defenses four times (2006, 2010, 2011, and 2014), and great defenses twice (2012 and 2013). It stands to reason that in years where Narduzzi had the services of future professionals, his defenses performed much better. 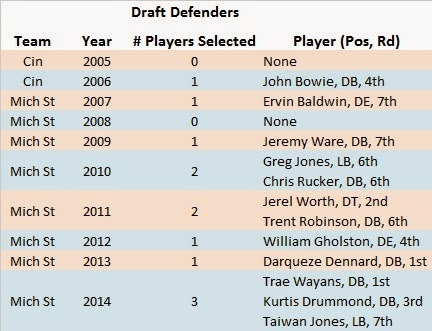 To determine if this is true, I looked at how many players from each defense were selected in the following year’s NFL draft. The table below lists the number of draft picks each defense produced and where they were drafted. For example, the 2007 Michigan State defense had one player selected in the 2008 draft. Obviously, this is not a perfect method because a defense may not have a player get drafted immediately afterward because they are an underclassman. Still, it gives us a good idea as to what kind of talent Narduzzi has been working with. Since the 2015 draft has not occurred yet, I used a time machine, the latest draft projections from CBS Sportsline. As you can see, from 2005 through 2008, only a pair of players were drafted from Narduzzi defenses with neither being what one would classify as an elite-level talent. It should be noted that two players, Haruki Nakamura and Deangelo Smith, from his Cincinnati defenses were drafted after he and Dantonio departed. Perhaps not coincidentally, these are among the worst defenses Narduzzi coordinated. Over the past five seasons, Narduzzi has coached nine players who have either been drafted or are set to be drafted this spring (not including Shilique Calhoun who has elected to stay in school). His defenses have been either good or outstanding in that time frame. When Narduzzi has talent on defense, he has produced fantastic results. Obviously, he is not perfect, but when he is given great talent, he doesn't bury that talent in the ground. So what does that mean for Pitt in 2015 and beyond? Well, Narduzzi will not be coordinating the defense himself. Even though he may not be calling the defense looks and plays, part of being a good defensive coach is training players to line up, read their keys, and use their instincts. With the relative talent level on the Panthers one would be hard pressed to believe they would finish in the bottom third of the ACC on defense next season with someone of Narduzzi’s caliber even tangentially involved. So now that we know a little about Narduzzi, what do we know about programs that hire former defensive coordinators? This may come as a surprise, but Narduzzi is in somewhat rare company moving from a defensive coordinator to a head coach at a BCS/Power Five school. Since 2008, it has only happened ten times. However, only eight of those instances bared any similarity to this one. A pair of schools had to hastily promote their defensive coordinators in 2011 (Ohio State and North Carolina) after their head coaches were let go for one reason or another. For that reason, I have omitted Luke Fickell and Everett Withers from this analysis. We’ll tackle the other eight chronologically. Bo Pelini, Nebraska, 2008 – Fresh off coordinating the defense for the national champion LSU Tigers, Nebraska hired Pelini to lead a program that had suffered two losing seasons in the past four years. Pelini led the Cornhuskers to seven consecutive bowl appearances and three conference title game appearances. He was fired because the school couldn’t reach the elite status they last attained a decade and a half prior (and some off the field stuff). All things considered, he was a pretty good hire. Frank Spaziani, Boston College, 2009 – After Boston College foolishly fired Jeff Jagodzinski for interviewing for an open NFL job, the Eagles handed the reigns to their longtime defensive coordinator. The Eagles qualified for bowl games in Spaziani’s first two years, but their record declined during each of his four seasons, bottoming out at 2-10 in 2012. Bad hire. Paul Rhoads, Iowa State, 2009 – In what ended up being a swap of sorts, Iowa State head coach Gene Chizik went to Auburn, and Auburn defensive coordinator Paul Rhoads took Chizik’s place in Ames. Thanks to Cam Newton and some dirty money, Chizik now has a national title (think about all the illustrious coaches that do not). Rhoads has led the Cyclones to some monumental upsets and three bowl appearances in six seasons. However, after going 5-19 the past two seasons, he is squarely on the hot seat heading into 2014. Decent hire. Charlie Strong, Louisville, 2010 – The Florida defensive coordinator took over for Steve Kragthorpe at Louisville and after a pair of 7-6 seasons to open his tenure, won 23 of his final 26 games at the school, including the Sugar Bowl following the 2012 season. Slam dunk hire. Will Muschamp, Florida, 2011 – Following the departure of demigod Urban Meyer, the Gators tabbed the Texas coach in waiting Will Muschamp to be their guy. Outside of a banner 2012 season where the Gators rode a stout defense to a one-loss regular season, the Gators were never close to their elite pedigree. Not as bad as Ron Zook, but a bad hire. Mark Stoops, Kentucky, 2013 – After leading the Florida State defense for three seasons, the third Stoops brother to be in charge of a major college football program headed west to the SEC East and Lexington, Kentucky. The Wildcats did not win a conference games in Stoops’ first season as coach, but improved to five wins in his second season. Too soon to say, but early returns are solid. Scott Shafer, Syracuse 2013 – After head coach Doug Marrone led the Orange to a pair of bowl bids over four seasons (quality work considering his predecessor), he stayed in upstate New York, but moved to the pros. The Orange promoted Scott Shafer, their defensive coordinator under Marrone, to be their head coach. Shafer’s first season ended with a middling 7-6 mark and his follow-up campaign resulted in a dreadful 3-9 record. He is squarely on the hot seat entering his third season. Too soon to render a final judgment, but returns are not promising. Derek Mason, Vanderbilt, 2014 – After the most successful run in school history since the Eisenhower administration, James Franklin finally cashed in his chips and headed north to Happy Valley. To replace him, the Commodores looked west to another institution with great academic integrity, Stanford. Mason was on the Stanford staff for four seasons and four BCS bowl games, the last two in the role of defensive coordinator. However, his first season in Nashville was a disaster. The Commodores went winless in the SEC and managed just three wins overall. One season is never enough time to properly judge a coaching hire, but it appears as if Mason is in over his head. Of the eight defensive coordinators who became head coaches at BCS/Power Five programs since 2008, three have been fired (although one could argue Pelini’s struggles away from the sidelines were more of a factor in his demise), three more could be fired in 2014 (Rhoads, Shafer, and Mason), one has parlayed his success into a bigger job, and one has a tough task in front of him in the nation’s strongest conference. Each job and the expectations that come with it must be evaluated individually, but moving from defensive coordinator to head coach has not been a slam dunk proposition. Selecting coaches is a crapshoot (for the most part). You never know which FCS or mid-major coach will struggle at the next level. You never know which coordinator will be unable to recruit enough top-shelf talent or talent that fits his particular scheme. You never know what others schools in the conference will make slightly better coaching hires the same year (or the previous year or the next year). Conference wins are a zero-sum game after all. Hell, if you’re Pitt, you never know which coach might commit a felony or leave after one season. That being said, the Panthers have hired a defensive-minded coach with a good track record. Narduzzi didn’t produce great defenses at an old-money program like Alabama or Ohio State. He did it at a nouveau riche school that was actually not even the best program in its own state when he arrived. His hiring may not work out, but the Panthers have certainly given themselves a shot to break out of the six or seven win rut.